Arianespace’s Ariane 5 launcher logged another heavy-lift mission achievement, orbiting commercial telecommunications payloads today for leading Asia-Pacific operators MEASAT and Optus on Flight VA218. 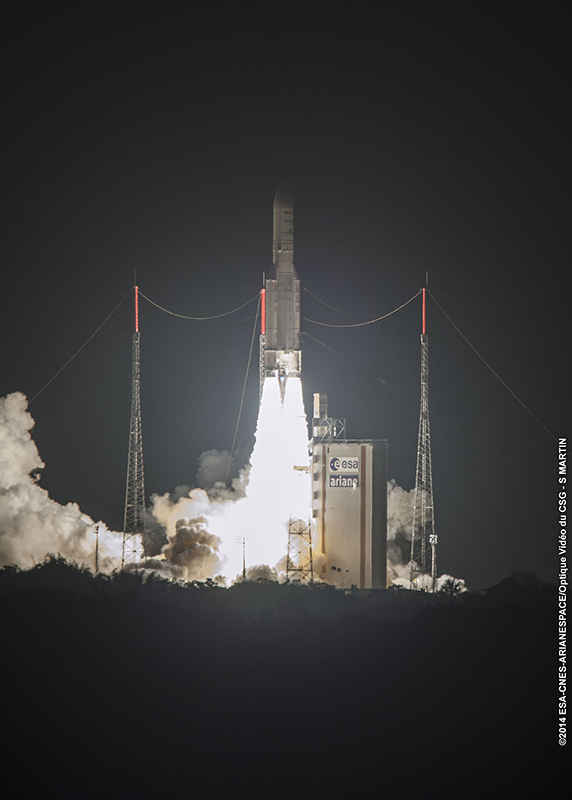 Lifting off from the Spaceport’s ELA-3 launch zone in French Guiana, Ariane 5 successfully deployed MEASAT-3b and Optus 10 into geostationary transfer orbit – marking its 61st consecutive successful mission. Arianespace Chairman and CEO Stéphane Israël noted that a total of 100 communications satellites have been delivered to geostationary transfer orbits by Ariane 5 during this unbroken string of successes. 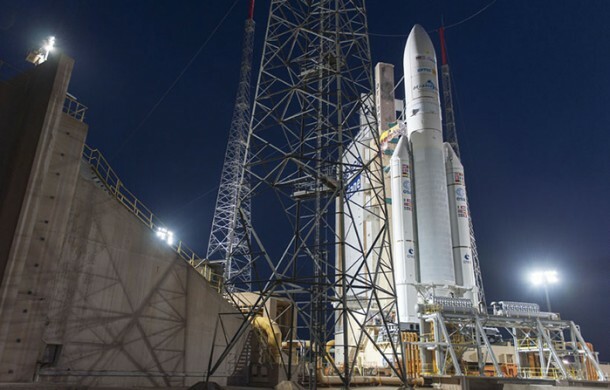 Ariane 5 is shown in the ELA-3 launch zone prior to its liftoff on Flight VA218, which orbited the MEASAT-3b and Optus 10 satellites. MEASAT-3b is the third spacecraft Arianespace has lofted for this Malaysia-based operator, and will expand MEASAT’s telecommunications and direct-to-home broadcast services in Malaysia, India, Indonesia and Australia. Built by Airbus Defence and Space, MEASAT-3b has a design life of 15 years and will operate from an orbital position of 91.5 deg. East. Flight VA218’s Optus 10 passenger was the sixth Arianespace has lofted for Australian operator Optus, which will utilize this satellite to provide direct TV broadcast, Internet, telephone and data transmission services for Australia, New Zealand and the Antarctic region. Optus 10 was produced by SSL (Space Systems/Loral) with a design life of 15 years and will be positioned at 164 deg. East in orbit. Paul Sheridan, the Vice President of Optus Satellite, offered a special recognition of Arianespace for its continued support during the two companies’ long-term relationship. “This is our sixth launch with the Ariane team, and it is worth noting that it’s been almost 30 years since the partnership commenced,” he added. Ascending from French Guiana, Ariane 5 lights up the Spaceport during its successful Flight VA218. Ariane 5’s total payload performance for Flight VA218 was approximately 10,090 kg. – including its MEASAT-3b and Optus 10 payload and associated integration/deployment hardware. Israël said the company’s next launch is another Ariane 5 dual-passenger mission to geostationary transfer orbit in October. It will carry ISDLA-1 for DIRECTV and Intelsat, which are two long-time customers of Arianespace; along with ARSAT’s ARSAT-1 – the first geostationary communications satellite built in Argentina.